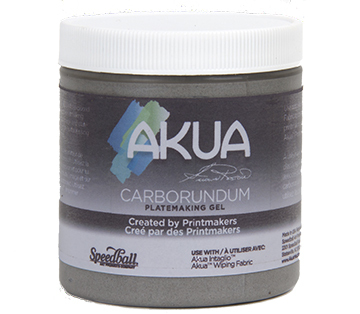 The Akua Carborundum Gel for Platemaking is used to create collagraph printmaking plates. This ready-to-use platemaking gel offers a reliable medium that delivers fine, sharp detail and a uniquely textured surface that yields rich, velvety areas of color. Printmakers have been experimenting with methods for making carborundum prints for decades. Akua Carborundum Gel improves results by offering a formulation that is consistent and reliable. Carborundum Gel is performance-tested, so printmakers can rely on the consistency of this platemaking medium from start to finish. As a result, prints will be strong and vivid, each and every time. But what is Carborundum Print/Platemaking? 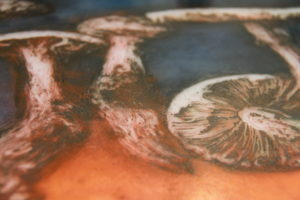 Carborundum printmaking is a collagraph process in which the image is created directly on the plate by applying an abrasive grit (Carborundum) mixed with an acrylic medium or glue. 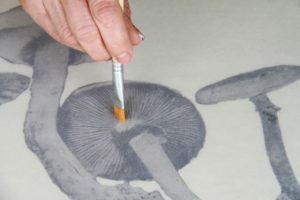 Once dried, it forms areas of texture or line which is then inked intaglio, relief or both. 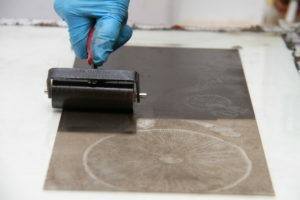 The plate is printed with an etching press in the same manner as other printmaking plates. Since the Carborundum mixture is built up on the plate, the paper embosses when going through the press creating a rich, dense surface. The plates can be printed many times. What kind of medium is the Carborundum Gel? Akua Carborundum Gel is an acrylic medium. What kind of grit is used in Akua Carborundum Gel? #220 Grit is used. Can I paint with it? Yes, Akua Carborundum Gel can be used to paint onto a plate. How do I clean my Carborundum plate? Gently wipe with a soft textured rag that is lightly dampened with water and liquid detergent. We recommend a micro fiber rag. Thick application - at least one to two days, typically. **Note: When the plate is dry, it plate should feel rough (like sand paper) to the touch, not smooth or soft. How do I ink my Carborundum Gel plates? 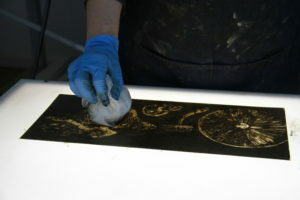 We recommend using a Speedball Soft Rubber Brayer to roll and press the ink onto/into your plate. This will allow less wear and tear on the plate surface opposed to a traditional squeegee or inking card. Will the Carborundum Gel shred my tarlatan or Akua Wiping Fabric? Because the grit in the gel is so fine, it will not shred or tear your wiping fabric if you wipe gently. Aggressive wiping may cause some slight shredding. What kind of paper should I use to print my Carborundum Gel plates? 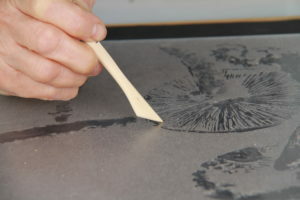 Any traditional printmaking paper can be used. Dampening time will vary depending on the paper.